Our turkeys are delicious because they grow slowly, the way nature intended, without growth promoting hormones, stimulants, or antibiotics. Our turkeys are fed an All Natural Vegetarian Diet from our feed mill, then provided plenty of sunshine and open pastures to roam. Our practices guarantee a delicious, all natural turkey that is unsurpassed in quality. One taste and we are sure you will agree. We feed our flocks a vegetarian diet fortified with vitamins and minerals which is a natural defense against bacterial organisms. Our feed mill is located right on our farm and utilizes locally grown corn and roasted soybeans for our specially formulated feed. Our turkeys never receive antibiotics or growth promotants at any time. Animal by-products, fats, bakery or pet food products are never used in our poultry feed. Our turkeys are antibiotic free and have free range access to outdoor areas that provide natural sunlight and fresh air. Our turkeys meet the very strict Certified Humane® guidelines and Farm Animal Welfare Standards for turkeys. In addition to meeting these guidelines, Koch's scored a 100% on the Turkey Welfare and Humane practices independent audit by Steritech. 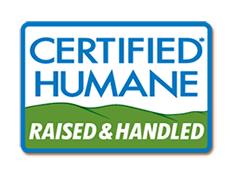 For more information, please go to Certified Humane®. The Global Animal Partnership (GAP), a nonprofit charitable organization founded in 2008, brings together farmers, scientists, ranchers, retailers, and animal advocates - a diverse group with the common goal of improving the welfare of animals in agriculture. The 5-Step™ Animal Welfare Rating Standards recognizes and rewards producers for their welfare practices, promotes and facilitates continuous improvement, and better informs consumers about the production systems they choose to support. With the successful completion of a pilot program with Whole Foods Market, the leading natural and organic food retailer, GAP is engaging with new retail partners, both restaurants and grocers. This program provides retailers and food outlets an animal welfare labeling program that demonstrates their commitment to animal welfare and helps inform consumers about how the products they choose to buy were produced. As of May 1, 2014, the 5-Step™ Program includes 2,406 farms and ranches that range from Step 1 to Step 5+ and raise more than 147 million animals annually. We offer a number of products that are USDA certified organic. From our whole turkeys to our drums, wings, and bacon, you can be sure our turkeys are grown and processed according to federal guidelines. The USDA certified organic regulations require that our animals are raised in living conditions accommodating their natural behaviors (like the ability to graze on pasture), fed 100% organic feed and forage, and not administered antibiotics or hormones. For more information regarding USDA certified organic products, go to USDA. We are proud to say that some of our Organic products are verified by the Non-GMO Project. What does this mean for you as a consumer? Products bearing this label have passed the rigorous verification process set forth by this organization. Below is a list of consensus-based best practices that are required for verification. • We require ongoing testing of all at-risk ingredients - any ingredient being grown commercially in GMO form must be tested prior to use in a verified product. • We use an Action Threshold of 0.9%. This is in alignment with laws in the European Union (where any product containing more than 0.9% GMO must be labeled). Absence of all GMOs is the target for all Non-GMO Project Standard compliant products. Continuous improvement practices toward achieving this goal must be part of the Participant's quality management systems. • After the test, we require rigorous traceability and segregation practices to be followed in order to ensure ingredient integrity through to the finished product. • For low-risk ingredients, we conduct a thorough review of ingredient specification sheets to determine absence of GMO risk. • Verification is maintained through an annual audit, along with onsite inspections for high-risk products. For more information regarding the Non-GMO Project, go to Non-GMO Project.